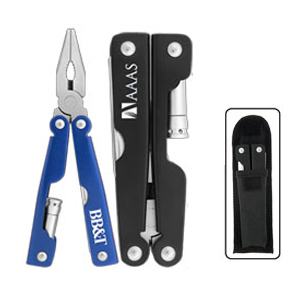 Stainless steel metal multi-tool with flashlight, pliers/cutter, bottle opener, can opener, knife, saw, file and a flat head screwdriver in a carrying case. Price includes choice of laser engraving or one colour pad printed logo. We recommend laser engraving. Printing may fade over time.